“The Lent Madness Supreme Executive Committee congratulates Francis of Assisi on his victory in Lent Madness 2015. With over 8,200 votes cast, Francis and Brigid of Kildare staged an epic neck-and-neck race throughout the day, fueling saintly passions across the globe. The SEC has certified the election (after having to zap some votes from several over-voters). In the end, rest assured that the result was close but clean.” Read more here on the Lent Madness site. 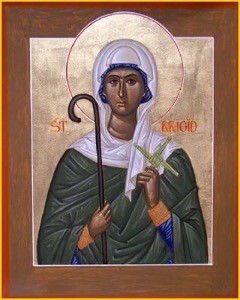 On a side note, Brigid of Kildare won on the St. Luke’s site. There is good news…the Lent Madness mugs are available for both St. Francis AND Brigid. Stay tuned on Facebook for announcements about Brigid’s mug. Pre-order yours now! 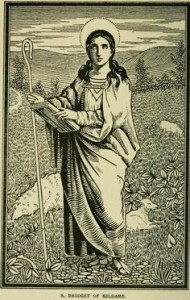 And then there were two… Brigid of Kildare beat out Egeria on Lent Madness site, whereas on the St. Luke’s site, we chose Egeria! But here we are. The last two standing looking to capture the Golden Halo. For the Golden Halo: Francis of Assisi vs. Brigid of Kildare. Remember: vote at Lent Madness here AND ALSO below the saint bios here so we see how the readers of the St. Luke in the Fields blog compare! Results of this match up will be reported TOMORROW! Francis trounced Molly Brant on Lent Madness site, running away with 71% of the vote. On the St. Luke’s site, Francis was the overwhelming winner, winning a whopping 91% of the vote. This match up is Brigid of Kildare vs. Egeria. Winner of this will face off Francis of Assisi for a shot at the Golden Halo! I fear I must trouble you with a story. 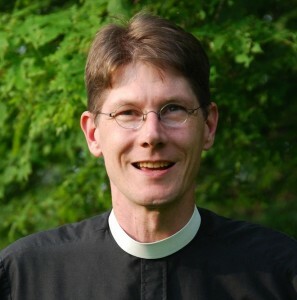 I was ordained to the diaconate on February 1. I learned that it was St. Brigid’s day when I was filling out the form for my ordination certificate, but I didn’t think much of this — merely that she sounded Irish or something, which might please my grandmother. During the service, several things went awry. Not so badly as to spoil the day (it was glorious) but just as to be disorienting. So when it came time for the bishop to lay hands on our heads, I guess he was a mite flustered. He put his hands on my head (I came first, alphabetically), and said the prayer of ordination, ending with “By the power vested in me, I now ordain you a bishop…. Everyone got a good chuckle, and he took a breath and finally ordained me to the correct order of ministry. Thank the good Lord. Afterwards, at the reception, my presenting priest commented to me that this was a really appropriate occurrence for Brigid’s day. I looked at her blankly, and she smiled, and told me to do some research. Sure enough, I discovered that Brigid has much to commend her, even besides her penchant for microbrewing before it was popular. Her leadership, her wisdom, her generosity, her tenacity in what she knew was right (she marched across Ireland and back!) are rare and valuable indeed...Read more here. Holy Week, as observed through liturgy, changes a person. From the shouting, singing frenzy of Palm Sunday, to the poignant movements of Maundy Thursday, and the descent into the darkness, to the bleak desolation of Good Friday, to the expectant waiting and watching of the Vigil, which finally explodes into sunlight and the joy of Easter. One week captures all human emotion and wraps it in prayer. Jerusalem, too, changes a person. There is a saying you hear when you visit on pilgrimage: “Go to Jerusalem for a week, you write a novel. Stay for two — you cannot write even a sentence.” It’s a comment on the difficulties of conveying the depth of the experience, the complexities of people, the intensity of faith in this place. The heat of Jerusalem dries up your words. Egeria, however, held onto her words. She not only held onto her words, she gifted us with words that would echo down the centuries and affect each and every one of us. 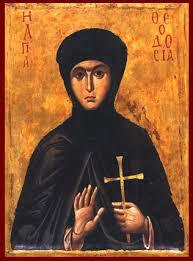 When she went on pilgrimage, she wasn’t content with a surface view of the things she saw. She asked questions, she took notes, she recorded everything, she sent her observations back home so everyone there could share her joy...Read more here. Lent Madness: Holy Competition in Holy Week? Every year around this time, a few people raise an objection to Lent Madness. Couldn’t you have finished it before Holy Week? Doesn’t this seem out of step with our pattern of worship this week? Well, yes.Lent Madness is most certainly out of step with the sacred journey of Holy Week, especially the Three Holy Days. There is also a deep blessing, a blessing even, in this dissonance. You see, by the end of Lent Madness, those of us who have been voting and joining in the vigorous discussion in the comments will know a fair bit about each of the Faithful Four competitors for the Golden Halo. Those who “get” the madness will probably have a favorite saint by now, but we’ll also realize that they’ve already received their prize. That frees us to celebrate whoever wins. This brings us to the journey of Holy Week. One way to understand this week is to see it as a way for each of us to enter intro the very heart of the great story of our salvation through Jesus Christ. We remember the hopes that were placed upon Jesus. We recall his commandment to his friends, and we recall the sacred meal he entrusted them to continue. We gaze with sorrow on the cross and remember how the whole world abandoned God’s precious gift of love. We grieve. Finally, we rejoice in the mystery of new life as Jesus Christ is raised, as we realize that God’s love is stronger even than death. And in all this, our lives are transformed. Perhaps some part of the story tugs at us, and we renew our commitment to follow Jesus. That’s just what the saints did. They lived transformed lives, renewed by the Gospel. In their lives we see Christ’s light shining brightly. We learn from their example, and we can carry on our journey knowing that we are able to call on them in prayer, as companions in our journey. The saintly smackdown has the allure of competition, but ultimately it is about encountering lives transformed by Jesus Christ. Holy Week is a whole bunch of liturgy, but ultimately it is about praising God for the mighty acts of our salvation and about renewing our journey as followers of Jesus. So I encourage you to do two things this week. In the early days of the week, cast your votes in Lent Madness. In the latter days of the week, find your way to a church and enter into the Three Holy Days.In all of this, we open ourselves to the transforming power of the Good News of Jesus Christ. Egeria eeked out a win 51% over Frederick Douglass’s 49% on Lent Madness site. 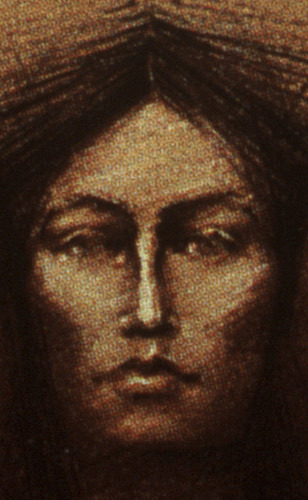 On the St. Luke’s site, Egeria was the overwhelming winner, winning 87% of the vote. Here we are at the Faithful Four. This match up is Francis of Assisi vs. Molly Brant. Our church garden is well-used holy space by all of God’s creation. One afternoon in October, members of our church gather with our companion animals and ask God’s blessing on these precious beings of God who share their lives with us. Over the years, more and more neighbors of many faiths join us, and what began as a small gathering has grown into a lively and sacred time filled with the chorus of barks and meows. Our St. Francis statue, nestled in a corner of the church garden, stands in witness to this holy gathering, reminding us of the man who saw God fully visible in every aspect of holy Creation. 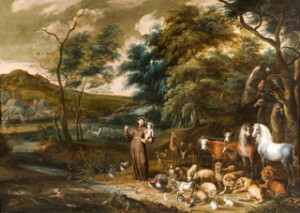 Francis, for his many gifts to the Christian faith, is likely most well-known as the namesake of the Blessing of Animals. 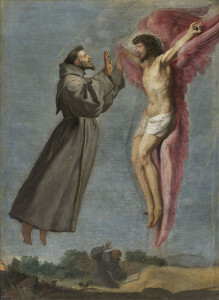 I suspect Francis, who spent his life responding to the great generosity of God in all he encountered, would probably offer he was just stating the obvious: that God is present in all that surrounds and sustains us and of course we should offer thanks and prayers. Francis’ most well-known prayer which he actually wrote, Canticle of Brother Sun, is a song to God who has so deeply entered creation that everything is connected in mystical union. Francis saw everything in creation related to one another and deserving of honor and love. The words remind us that no part of creation is too small or too great, too insignificant or too vast, to stand separate from each other. Brother Sun and Sister Moon are honored. Sister Water, Brother Fire, and Sister Mother Earth are all part of the unity of God. Even Sister Death, “from whom no living man can escape” is praised as part of God’s creative experience...Read more here. The first time I read Molly Brant’s history, I was immediately struck by her ability to navigate between two vastly different cultures and political systems. As one historian said, she was a “bridge between two worlds.” In the midst of our currently fractured political system, Brant’s life illustrates that there is another way — perhaps not a perfect way — but a means nonetheless of how people of differing cultural and political systems can strive to co-exist in times of uncertainty. Molly’s faithfulness to her Christian faith and her Mohawk family shaped her commitment to harmonious relations even amidst a war that sought to attain the allegiances of Native American tribes no matter the cost to tribal culture and way of life. Naturally, many debates have circled around Molly’s Loyalist leanings. However, one must remember that history is often on the side of the winner. Were we to step into Molly’s shoes, our view and esteem of her might be a bit different. Indeed, Molly’s life causes us to examine our own interpretations, leanings, and motivations and how they impact others. Ultimately, Molly’s goal was to preserve the cultural vitality and independence...Read more here. Molly Brant defeated Bernard Mizeki 59% to 41% Lent Madness site. On the St. Luke’s site, Molly Brant swept the floor with Bernard Mizeki, winning 83% of the vote. The next match up is Frederick Douglass vs. Egeria. Every tourist to Washington, D.C., visits the Washington Monument, Lincoln Memorial, and Capitol Building. Such sights are classic but they’re so…pedestrian. 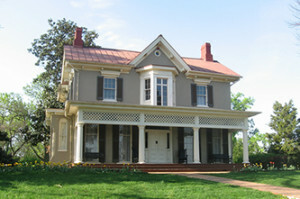 If you want a bird’s eye view of the city and an opportunity to imagine a day in the life of one of North America’s greatest embodiments of faithfulness, wisdom, and activism, head south to Cedar Hill, Frederick Douglass’ historic and beautifully restored property in Washington’s Anacostia neighborhood. There you’ll have a chance to walk his expertly manicured lawn, which Douglass tended and on which he lifted weights each morning. Yes, my friends, Douglass was a fitness buff and a naturalist who tended to his body and garden with great affection and detail. Indeed, he was a well-rounded man long before “well-rounded” became a buzzword on college applications...Read more here. 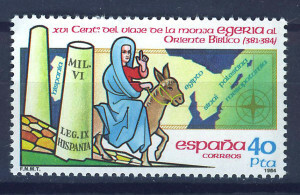 Egeria, kindly recollect, was a Spanish nun who travelled to Palestine, Turkey, and Greece from 381-384 CE, and wrote letters home describing her adventures. As befits one of the first Pioneers of PenPals, Spain issued a stamp for her in 1984.
every trip around the bowl is a pilgrimage for a goldfish who can only remember 30 seconds worth of stuff! Once she returned home, however, I feel confident in asserting that Egeria had a garment similar to this to notify people of her travels. Egeria is invoked as an authority by the custodian Franciscans who live in and care fore the Holy Sepulchre in Jerusalem, and they invite you...Read more here. 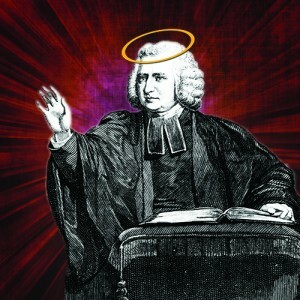 You are currently browsing entries tagged with Lent Madness at Blog of St. Luke in the Fields.